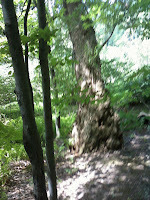 Set the alarm to get an early start today, as we headed out to Northamption State Park on the west side of Rochester. 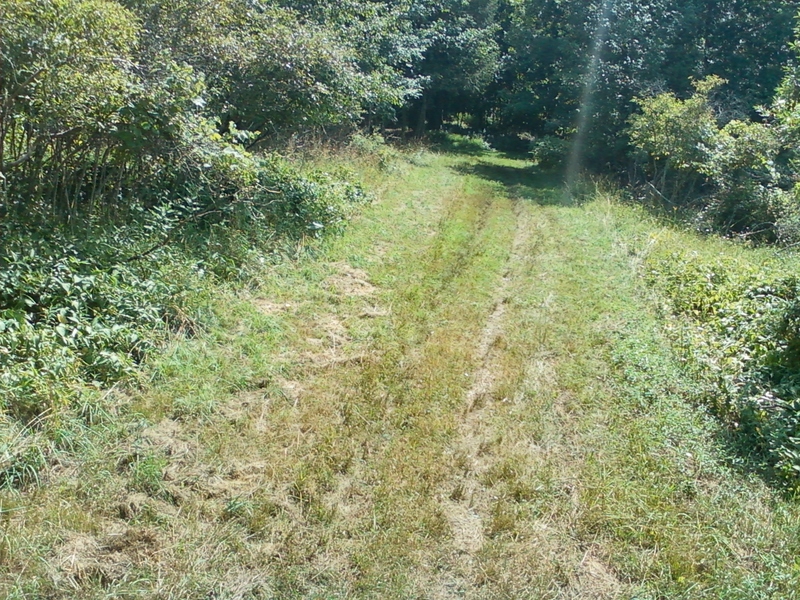 I had high hopes for the trails here, as the map I downloaded indicated not one but TWO horse trailer parking areas in the park, one in the middle and one on the west side. We arrived to discover there was a big weekend festival being held here, which included a barbecue cook-off and a blues and music festival. How cool was that! The horse trailer parking area had been cordoned off for $5 event parking, but they waved us through for free, since we obviously were headed for the horse parking area for a reason. I joked with the parking guy about having to suffer riding with the smell of bbq, but he echoed the same concern as he was manning the parking lot! We arrived to find two other small trailers already there, confirming our feeling that this was a good spot. Just as we were saddling up, two women arrived off the trail, and we chatted with them for several minutes about the condition of the trails and the efficacy of the trail maps. They were very helpful, especially in helping us find the east trailhead, as there were almost no real indications in real life where it started. 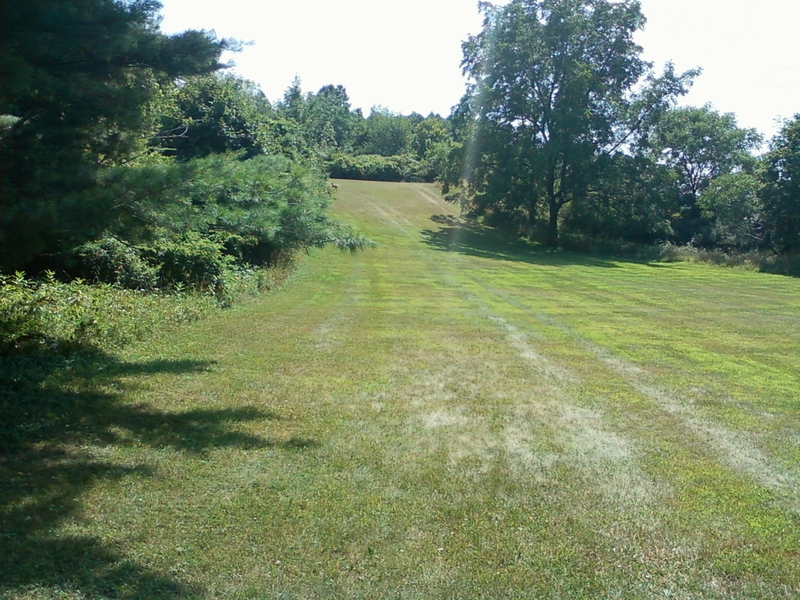 Seems we had to go down the road a bit, across the top of a “sledding hill”, then turn right along the brush line to the edge of a cornfield, where the trail actually began. Good thing they told us, we would have been wandering awhile looking for that one! We maneuvered the horses around the parking areas, the traffic and the people to get to the trailhead, then entered a wonderful section of thick woods on a well traveled trail. Nevertheless, there was a time or two I pulled out the camp saw to clear a few low branches that made the going tough, but for the most part, the trail was delightful. Only problem was there were no markings, and once again, we got turned around, not finding the proper loops as they were marked on the map, taking one linear trail to a road that we thought would be a loop, and after backtracking, not sure which linear trail we took. I’m still not sure how much of the actual loop we took, or how much we backtracked! Eventually we ended up back at the trailhead, so it didn’t really matter. Any time spent on the back of my horse is a good time! Besides, how often can you ride your horse while listening to live blues nearby? That was pretty cool! We had only been out for an hour or so, so we headed back toward the horse trailer, discovering that both the trailers that had been there when we arrived were gone. After a few minutes of letting the horses munch out on clover, we headed out the west trailhead, which, thankfully, was much better marked, with numbered intersections that actually corresponded with what was on the map (miracle of miracles). We looped around, going all the way to the west trailer parking area, which included having to cross a road (though there was almost no traffic on this side of the park). 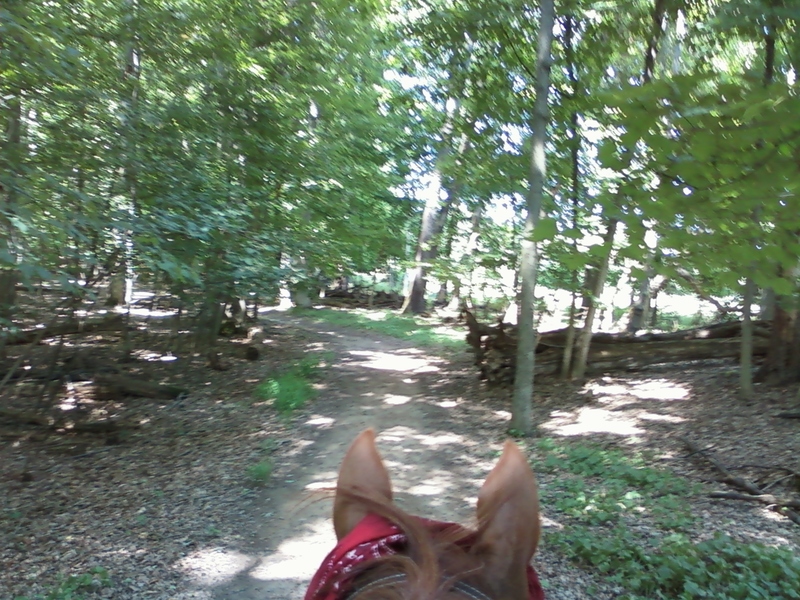 The trails were truly lovely, again with dirt and grass footing, but what made this one side particularly nice was that the bridle path was about 10 feet wide and mostly grass, but it immediately turned into thick woods, so there was a nice tunnel effect most of the time. 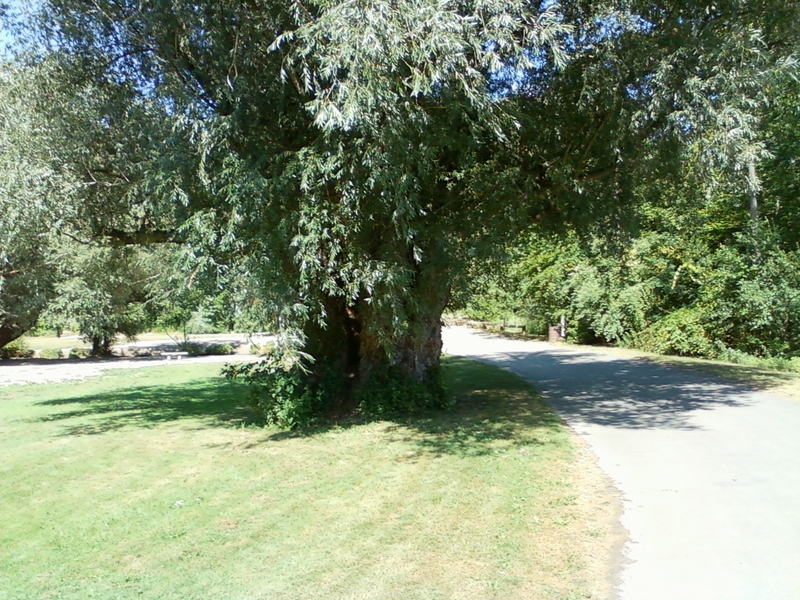 It was mostly shady, which was good because it had gotten rather hot today, but the wide paths made it easy to jog and canter several time throughout the ride. We circled the various loops, not having to take the same trail twice until the last 100 yards or so to the trailer area, and arrived back about 90 minutes later having thoroughly enjoyed the ride. One of the prettier rides in a “developed” park that we’ve ever been on. Once we unsaddled the horses, we walked over to the festival in search of ice cream (our new diet lunch, since we always seem to lose weight when we have ice cream for lunch lately, believe it or not! Plus it makes a nice change…), but we didn’t find them. We only discovered folks from all over the eastern half of the country from as far away as Iowa here to compete in the cookoff. Alas, BBQ wasn’t on the diet, and how would you be able to choose one anyway? 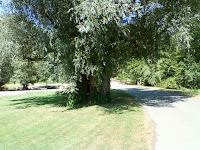 We didn’t find ice cream either, so we headed out shortly thereafter in search of the nearest ice cream shoppe. 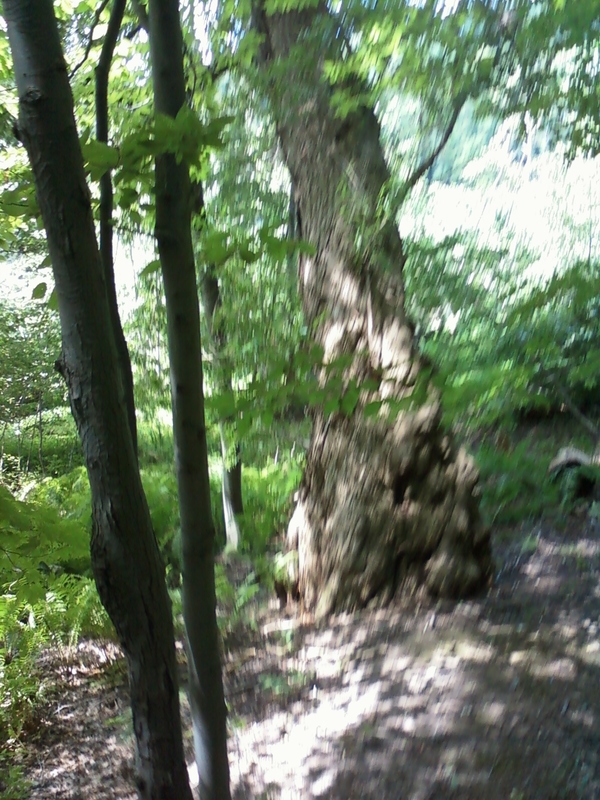 According to my GPS, that was in a nearby town of Spencerport, so we headed in that direction. Just as we arrived, we noted that the main street was cordoned off for a street festival known as Canal Days (as in Erie Canal, which runs through the middle of this and many other upstate New York towns). We barely managed to find a parking spot big enough for the horse trailer, then walked to a coffee shop first, who had surprisingly excellent coffee with a touch of cinnamon, then over to another place for some Abbots frozen custard, a local favorite. Really enjoyed that, it was very nostalgic, as we used to get that a lot as kids. Finally made it back home late in the day, have had a very fun-filled day! We had received a package from National Bridle yesterday, some stuff we had ordered just a few days ago, so Hubby spent the day putting things away and fixing things up so they would be ready for our next ride tomorrow. I did more paperwork and finished working on the outlines for our two workshops next week. Another day doing work-related stuff, setting up trips and writing workbooks for upcoming training sessions, while Hubby did a few chores around the “house”. Another visit to the chiropractor today for the two of us, Hubby still waking up with a stiff back, and me still trying to straighten out my shoulder once and for all. Masochistically insisted the doctor do some serious manipulation on me, and he did. I left feeling better, but more sore, if that makes sense. At least it feels as if some progress might be occurring, but only time will tell! 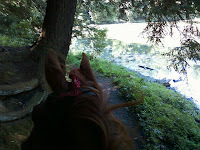 Today was the day we were going to try to get the horses’ feet wet in our final compass point, a beach in Lake Ontario. So far we’ve ridden the borders in the Atlantic, the Pacific, and the Gulf Coast of Southern Texas, and the only one left is the northern border. 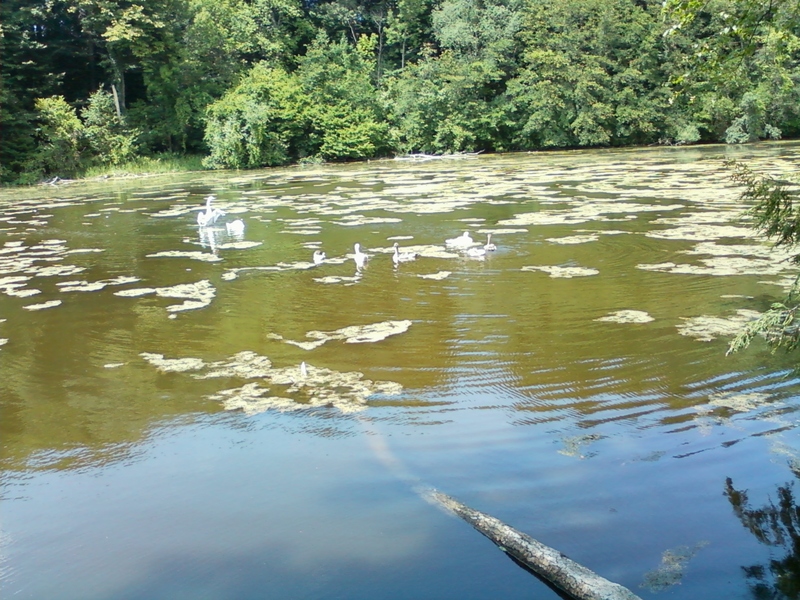 We headed out to Durand Eastman Park along the lakeshore near Seabreeze, a place I nostalgically remember from the days before my parents bought a cottage out at East Bay, not too far from where we and the horses are staying in Marion. I had called previously to learn where to park, and was told to go to the maintenance building off Zoo Road, which we easily found. As we were saddling up, though, one of the workers came over (and I think it was the same guy I spoke to, at least the voice sounded the same), who then informed me that the trails hadn’t really been maintained all that well lately, so we might have some problems. Not sure why he didn’t tell me that before we drove out here, but there you go. Anyway, we did have a few problems, but none were too difficult. Mostly it was just low-hanging branches and leaves, but there was at least one place we had to get down because the branch was too thick to move and too low to go under, though the horses had no problem once we were off. The trails essentially just edged along several ponds, and were pretty dry right now, though it was apparent from a parallel trail slightly higher up the slope that flooding was common here. At one point we even got to skirt a golf course, on which the horses gazed with interest at the various golfers, golf carts and golf swings. That didn’t last long before we were back in the woods circling the ponds. Finally we came to the road, which had to be crossed to get to the beach. We dismounted, and after waiting for traffic to clear, we managed to get them across safely. Unfortunately, we dicovered that the dropoff to the beach was too steep except in a few places, and those few places had families swimming and wading, despite signs saying No Swimming. We had hoped that being a Monday that it wouldn’t be that crowded, but no such luck. Well, we definitely didn’t want to have to retrace our steps, but a very short trip along the pathway took us to the end of Zoo Road, and we were back at the trailer in no time, a bit disappointed that we didn’t get to get our feet wet. We had only been out for about an hour, so we decided to head down to Ellison Park, near where I grew up, to go along the trails where I first learned to ride. A short trip down the freeway (sorry, they call it an expressway here, I remembered), and we were at the parking area the park folks had recommended. I had been looking forward to this for some time, but sadly ended up somewhat disappointed. 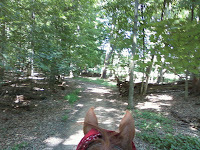 By starting at the middle of the trail instead of at Heberle Stables where I was used to, I had no memory of anything. They had obviously changed the trails considerably, as we soon got turned around in a disk golf course (which hadn’t been invented when I was last here), despite the fact that there were several markers indicating we were following the horse trail. The markings were terrible! It took us twenty minutes to convince ourselves that we had to go back the way we came, even though the map insisted we were supposed to be on one side of the creek, and the obvious trail was on the other side of the creek. After much discussion and several false starts, we finally managed to find our way up to the stables. As there were multiple “No Trespassing” signs, we were deterred from going up the trail any farther than the arena, then turned around, once again hoping that something would spark my memory, but not luck. It was all a mystery, and it was all poorly marked. After about an hour, we finally gave up and headed back to the parking lot, though we had a lovely gallop along the edge of the playground area which made it all worthwhile. Not as enjoyable as we had hoped, but at least now we can check these two off the bucket list! Decided we needed to get some more clothes and other items, so we headed out to Eastview Mall again, as well as to Walmart where Hubby had to pick up a prescription. Time for Hubby to get his chance to ride in Mendon Ponds Park!. We trailered the horses to the same parking area where we went on Monday, but this time instead of heading to the southern trail, we headed north to the longer trail. What a lovely ride! Once we found the proper trailhead, we followed the green blazes all the way to the water tower, which led us up and down moderate hills through a nice thick forest. The footing was mostly dirt, very little stone, so boots weren’t necessary. Eventually we climbed to the water tower, then shortly thereafter picked up the blue trail, which eventually led us to a grassy area that required us to ride along the road. 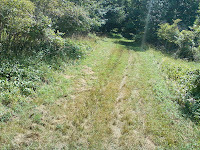 After turning the corner, we sooned followed the trail back into the grassy area, where we kept seeing a lot of deer. Once we saw two fawns laying down together, but they scooted off before I had a chance to get their picture. Gorgeous! Didn’t faze the horses a bit, though, it seems they’re getting used to coming alongside deer! It was a fabulous ride, we were out for more than three hours and enjoyed every minute of it. 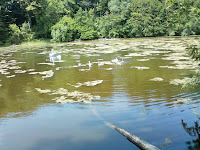 A really nice park that’s we’ll no doubt come back to, time permitting! Went to the local big mall, Eastview Mall in Victor, NY, and spent a good portion of the day getting some new clothes. We don’t shop often, but with all the weight we’ve been losing since our New Year’s Resolution in January, nothing fits anymore, so we had to bite the bullet and go shopping. Enjoyed it, though, we had a good time. Afterward, we met up with my friend Mary and her husband at the Wegman’s in Canandaigua. That’s a rather fancy grocery store that happens to feature a jazz quartet on Friday nights during the summer (I know, that sounds crazy, but it’s true!) Wegman’s is all the rage around town, apparently, with a special $6 dinner tray including main course and two sides. Unfortunately, the fish was served cold (it was pre-cooked, not sushi), which was odd, be we managed to find a microwave to heat it up. Not bad, though I can’t say it was really worth the money. Enjoyed the company and the music however, and that was the real reason we went! Had hoped to go riding today, but we were both sore from our chiropractic appointments yesterday, and I’ve gotten behind on some paperwork, so we spent the day doing chores and paperwork.